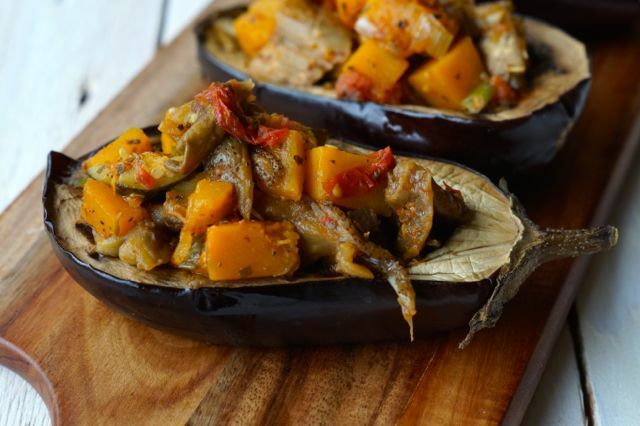 Slow Roasted Stuffed Eggplants | Why Should I Eat Eggplant? Fill your plates with VEGETABLES! Yes, we love our veggies. We especially LOVE eggplant and we LOVE pumpkin and we LOVE zucchini and we LOVE tomato… so we invented our Slow Roasted Stuffed Eggplants! We’ve always wanted to stuff eggplants with vegetables because they’re a pretty cool looking vegetable, plus when eggplants are slow roasted something magical happens… as in they taste all kinds of amazing. It’s like a party in your mouth, seriously. 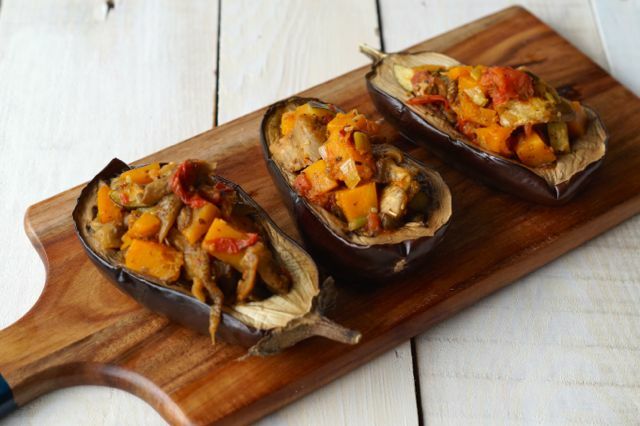 We’ve talked all things pumpkin before but what about eggplant (or aubergine to some! ), why should we add it to our plates?! Good question! Why should I eat eggplant? eggplant is FULL of vitamins and minerals (like most veggies!). Think: vitamin A, B vitamins, folate and vitamin C.
eggplant contains Chlorogenic acid which helps save your cells from oxidation. We don’t want this to happen, oxidation damages our cells and can contribute to disease. eggplant is anti-viral! Hooray! Love that. eggplant is a GREAT source of fibre! Inspired to get cooking with eggplant?! Of course you are! 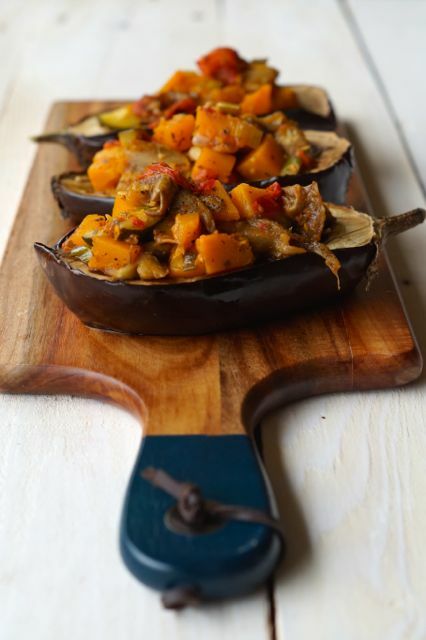 Simply grilling or roasting eggplant is a great (and tasty) place to start but why not go the whole she-bang and cook up our Slow Roasted Stuffed Eggplants?! They are so super yum… and are PERFECT for dinner, then lunch the next day! Have you noticed something different with our photos? We got our amazing creative blogger friend to make these AWESOME photo boards! She’s even written a DIY tutorial, so you can make your own! Preheat oven to 150°C (300°F) and line a baking tray with baking paper. Place the eggplant halves open side up on to the baking tray and drizzle with 1 tbs. macadamia oil. Place in to the oven for 1 hour and 20 minutes. Meanwhile, chop all of your vegetables and place them in a large saucepan. Add the dried herbs, macadamia oil and salt and pepper. Mix well. Place on to med-low heat and allow to simmer, then turn down to low. Continue to cook the vegetables for around 40 minutes or until soft. Once the eggplants are cooked, carefully spoon out a little of the eggplant centres and add to the saucepan, mix again. Now place even spoon fulls of the vegetables in to the eggplant centres and boomshakalaka delish dinner is served! Serve for dinner or as a delicious side! These are also PERFECT for lunchtime leftovers!